Plundered by humans of their habitats, animals take a drastic step when they decide to send a team of a cat named as Katy and a dog named as Dug, to an invisible island known, as the Island of 'Five Hundred Graves'. The island becomes visible only for a short time on the night of the full moon. Legend has it that the island is inhabited by the demons. 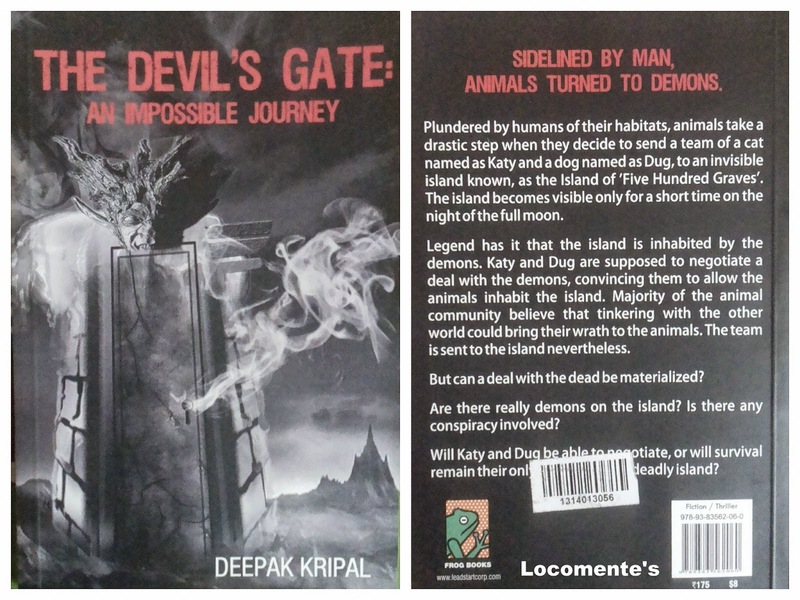 Katy and Dug are supposed to negotiate a deal with the demons, convincing them to allow the animals inhabit the island. Majority of the animal community believe that tinkering with the other world could bring their wrath to the animals. The team is sent to the island nevertheless. But, can a deal with the dead be materialized? Are there really demons on the island? is there any conspiracy involved? Will Katy and Dug be able to negotiate, or will survival remain their only question in the deadly island? A doctor by profession, Deepak has had the privilege to spend his life in scenic hills of Uttarakhand, the hustle and bustle of Kanpur and the unstoppable vibrancy of Delhi. He is a doctor by profession, and a writer by choice. When he is not working, he chooses to spend his time writing. A passionate human at heart, "The Devil's Gate" is his first book. Katy, the cat. She is smart, good-thinker, quick-witted and courageous. Dug, the dog is talkative, funny and enjoys self-boasting. Billy, the owl is confused and tries hard to get out of his father’s shadow. Cheeku, the demon is sweet and helpful. To begin with, the cover page is well-illustrated. It wonderfully represents the most important twist in the tale. The title suits the plot. The book blurb gives a brief outline of the story and rightly builds the anticipation. All these three elements has the full capability to attract really young (kids) audience. The writing style is simple and the narrative is lucid. The author has beautifully woven and presented a different world for us where animals speak. The dialogs are smart and many times evokes laughter. The anticipation of “what next?” is nicely maintained throughout the book. When one mystery is solved another begins. There are several twists and turns which keeps the readers hooked to the book. The story is well-narrated that it almost becomes picturesque. You are creatively encouraged to see what the protagonists see and feel what they feel! Dug and Katy are adorable. They kind of reminded me of Tom and Jerry and for whatever reasons. Could be because of the rare cat-dog duo. There are several thought-provoking lines and the very plot of the book is environmentally relevant. That is to say, there is a moral for the story! The story ends with a mysterious note. Do I smell a sequel? The twists and turns starts taking a toll on you and seems to be never-ending; more so towards the end. This is a very different genre. And, I am glad that some author has taken an initiative to write a book that can be enjoyed even by children who are just 8-10years old. Well, this can be very well termed as a “family entertainer”. Playing with danger is a child’s play. Real game is when the danger starts playing with you.